Pongal, the famous south indian breakfast made from rice & dal with some flavorful tempering and it's completely without onion and garlic.Here in the recipe, instead of rice,i have used millet(Barnyard rice) and it tastes so good. It's one of the easiest recipe that you can try with millets, no need to worry about perfectly cooked grains and all, dump it all together in pressure cooker, once it's ready, do the tempering. That's all. Delicious pongal will be ready in mins !!! Take millets and dal in a pressure cooker,wash it twice and then add the water & salt into the cooker. Cover the cooker with lid and put the lid on, cook it for 3 whistle. Now for tempering, heat 1 tbsp of ghee in a pan. Take all the tempering ingredients and add into the ghee, saute till nice aroma comes. Add the tempering into pongal. Now add the remaining ghee and give a good mix and it's ready to serve. Tasty & healthy Kuthiraivali Pongal is ready to serve. Serve it with sambar and/or chutney. If you don't want mushy pongal, reduce 1/2 cup of water. Ginger gives great flavor to the pongal, so don't reduce the amount of ginger also. Pongal in the pool of sambar is how I like it. :-) I wish I could grab that now Sandhiya... Agree about packing millet pongal for lunch. I tried for vaandu but he didn't like it. So I pack the regular rice one. 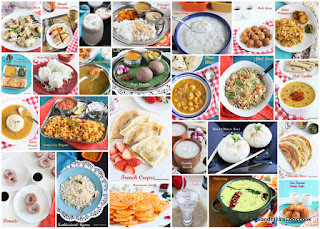 Ultimate pongal, what an incredible twist to the usual pongal. I love these sort millets based breakfasts very much. And you got that prefect pongal texture, amazing. Sure it must be delicious besides being healthy . This is such a great treat for ven pongal lovers. I would love this with chutney, sambar, kesari and vadai. Yeah, sure it's a treat for pongal lovers. Wow, what a comforting khichdi that is. Using Millet instead of rice is such a healthy idea. That plate with khichdi and sambar looks so inviting. I always make ven pongal with millets it is so healthy and a variation from rice.. Beautifully presented!! I just love how versatile millets are and they cook so quickly. Millet pongal looks so yummy and its healthy. Years back when I didn't know much about South Indian cuisine besides idlis and dosas, I had just moved to Bangalore to be with my daughter. We had moved into a new apartment and at time there weren't many shops around. After setting up the home, daughter and I were hungry and we had no gas. So went to the only small restaurant nearby and ordered pongal as that was all that was left. We ordered it not knowing what it is. When we got home and opened the packet both of us said khichdi at the same time. That was my intro to pongal. Such a memory it is, Mayuri. Yeah it's southern version of khichdi. I could so easily make this for my regular pongal, lovely idea..the plate looks so inviting Sandhiya..
Pongal and sambar a classic combo, after making millet pongal I have totally forgotten to make regular pongal, we got so used to that taste!a perfect meal for anytime ! I love the way you served this pongal with sambhar. I have a big batch of barnyard millet, will try this pongal with it. Pongal and sambhar plate looks very inviting. I love pongal in any form and I bet this millet version tastes good too. Pongal is my go to dish when I am in a hurry to prepare breakfast / when I run out of dosa batter. Adding millets is such a healthy idea. Love that pic with a big dollop of pongal amidst the sambar.Super! LOve the pongal and barnyard for pongal is interesting choice.. love the mashy look.